In order for magnesium (Mg) from a supplemental feed source to be bioavailable, it must be absorbed from the digestive tract. Single-stomached animals--swine, poultry, horses, dogs,cats--absorb magnesium primarily from the small intestine. However, ruminants absorb most of the Mg from the rumen, provided the Mg source is sufficiently soluble while in the rumen. For many supplemental MgO sources, solubilization may be the primary factor limiting the amount of bioavailable Mg. University research trials show that feed grade magnesium oxide sources differ in their rate of solubility and absorption in cattle. Following are highlights from these trials. One university trial compared the solubility of various feed grade magnesium oxides in vitro. This test was designed to simulate conditions in the rumen and the abomasum or true stomach. A sample of each MgO source was incubated in the rumen system at a pH of 6.95 to 6.30 for 48 hours. Then the samples were acidified to pH 2.0 for 1 more hour to simulate conditions in the true stomach. The following shows the percentage of Mg that was solubilized in each set of conditions. MAGOX was the most readily soluble MgO source in both ruminal and abomasal conditions. Reference: Beede et al, 1989. Proc. Florida Dairy Prodn. Conf. Another university test compared the rumen solubility of MAGOX vs two other feed grade MgO sources in rumen fistulated steers. The MgO sources differed in their rates of reactivity as measured by pH stat titration. T50 times of the sources were Magox (15 min. ), 56% source B (40 min. ), and 58% prilled source A (500 min.). After steers were adapted to their diets, rumen fluid was analyzed for Mg before feeding and 5 hours after feeding. After 5 hours MAGOX fed steers had a fivefold increase in rumen soluble Mg vs control animals. 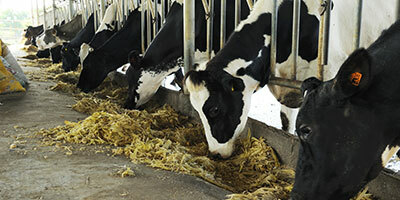 Compared to MAGOX, source B was only 73% as soluble and source A was only 29% as soluble in the rumen. Greater solubility means more MgO is available for absorption and for neutralizing rumen acids produced by feeding high concentrate rations. MAGOX was more readily soluble in the rumen than two other less reactive MgO sources. Reference: Noller, et al, 1985. J. Animal Sci. 61 (Supp. 1):122 (Abstr.). Twenty-four Holstein heifers at the same university facility were fed a control diet or one with 76 grams daily of either MAGOX or source A (T50=500 min.). Mg absorption was determined by measuring urine Mg concentration. On day two of the test, heifers fed source A absorbed only 62% as much Mg as those fed MAGOX. Reference: Wheeler, Linda J., et al, 1985. J. Animal Sci. (Supp. 1):465 (Abstr.). Tests at another university determined Mg absorption in four lactating cows fed a control ration or one supplemented with 0.4% of one of three MgO sources differing in their rates of reactivity. MgO sources and their T50 times were MAGOX (18 min. ), 58% prilled source B (127 min.) and 58% source A (166 min.). MgO particle sizes were standardized as much as possible. Again, Mg absorption was determined by measuring urine Mg excretion. MAGOX fed cows absorbed 15% more Mg than those fed either source A or source B and 28% more than those fed the unsupplemented control diet. Cows and heifers absorbed more Mg from MAGOX than from either of two other MgO sources in the ration. Reference: Xin, Z.X. et al. 1987. J. Dairy Sci. 70 (Supp. 1):201 (Abstr.). What's the meaning of reactivity time? "REACTIVITY" refers to the rate of reaction of a material in dilute acid solution. All magnesium oxides are alkaline materials and therefore react with acids. However, due to differences in temperature and other processing conditions, MgO sources may differ greatly in their rates of reaction with acid or their "reactivity". This can affect the rate of MgO solubility in the rumen, and in turn, the rate at which Mg may be absorbed by the animal, as shown by the above tests. The "T50" method or pH stat titration method was developed for evaluation of antacid materials by Steinberg, et al (1965). It was used to evaluate magnesium oxides by Purdue University researcher (Schaefer, et al, 1982) and following. Premier Magnesia uses this method routinely for evaluation of MAGOX and other MgO sources. Some typical T50 times of commonly used feed grade and reagent grade MgO products are shown below. Premier Magnesia recommends the more reactive MgO sources especially for (1) grass tetany minerals and (2) dairy buffers. MAGOX 54 Plus 12x50 mesh and Granumag 12x40 mesh are recommended for use in mineral mixes where durable, granular particles are a priority. Schaefer, D.M., et al, 1982. J. Dairy Sci. 65f:732. Steinberg, W.H., et al, 1965. J. Pharm. Sci. 54:625.